Retail brands like Apple get it. Hospitality brands like Hudsons Canadian Taphouse get it. Arts and culture-focused brands like the AGA get it. But interior design is an often overlooked aspect of reinforcing brand in both the corporate and professional environments. This company clearly doesn’t get it. How would you feel about walking into this disaster every morning? What is branding through interior design? Branding through interior design, (also known as the branded environment) is the process of transforming an office environment into a three-dimensional embodiment of a brand. One that instantly reinforces a company’s position, communicates its identity, unifies its culture, and delivers the brand experience to customers. 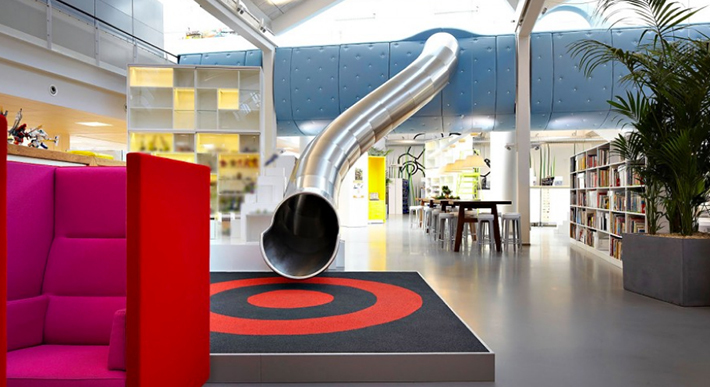 Does your office design energize your staff? Strengthen your brand? Reinforce your position? 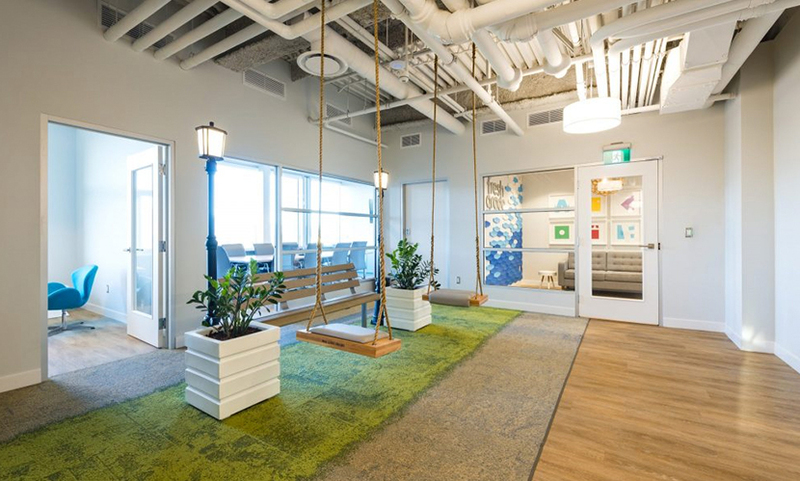 By integrating your brand strategy into the interior design process, you can create an office environment that helps employees, customers, and business associates better understand your company’s mission, vision, and values. 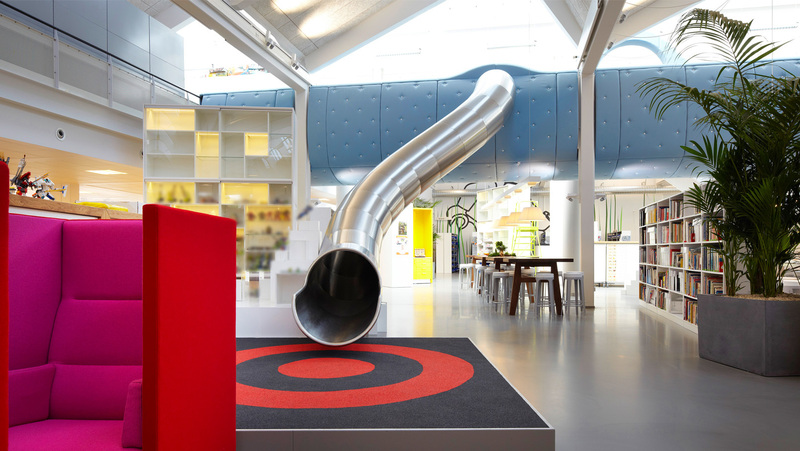 What’s included in a branded environment? A branded environment is devised of components such as architecture, layouts, finishing materials, lighting, environmental graphics, way-finding devices, signage, and décor elements that reflect and reinforce the personality of a business. It also extends beyond the office space to how a company designs and decorates its spaces at trade shows and hosted events. All of these elements work together to create a physical and sensory relationship with the customer. When implemented correctly the interior design communicates your brand’s message and it lets people touch, explore, and engage with your brand in the physical space. Your branded environment enables your brand to be experienced beyond print, web, advertisements, and television. Why is the “experience” important? What are the benefits of branding your environment? The benefits of a branding your environment are many. 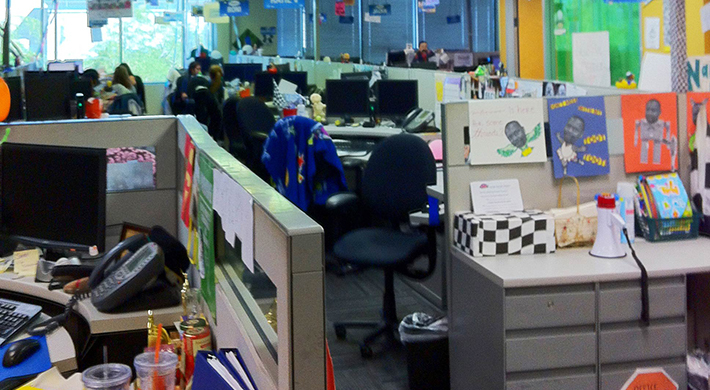 Internally, better environmental design leads to happier staff. Happier staff generally means higher retention rates, increased productivity, and a better understanding of your organization’s mission, vision and values. Moving outward, this leads to improved position and communication, better customer recognition, differentiation from competitors, and higher perceived value from your customers, investors, partners, and the media. What does a space like this say about Lego‘s culture? Who should be involved in the interior design process? Designing your branded environment should not be taken lightly. The process should be led by a Registered Interior Designer (RID) who is a member of the Interior Designers of Canada (IDC). A seasoned professional will know what questions to ask, how best to reorganize your space, work within your budget, and source the proper materials and contractors to bring your space to life. The process should also include a multi-disciplinary team of strategic consultants including a brand strategist as well as your marketing, communications, and graphic design team. Unsure of how to select an interior designer to help you with your new space? Aside from your budget and timeline, the most important things to consider are the designers’ qualifications and portfolio. Kelowna-based Hatch Interior Design provides a great “how to” guide breaking the process down from start to finish. Hatch is LEED ID+C accredited, NCIQD qualified, and run by an amazingly talented, chic, fun, and cool duo. Another thing that makes Hatch extra special is their exclusive focus on sustainable interior design. Just as important as your interior is the exterior of your space. Unfortunately many businesses don’t have a choice in this matter, for example, companies situated in malls, high-rises, etc. But for those companies that do have a choice, Edmonton-based architectural firm Ziola New Studio is an excellent company. Like Hatch, it too focuses on sustainable design, but for both the interior and the exterior. Ziola is the firm responsible for the ridiculously cool design of the clubhouse at the Jack Nicklaus Northern Bear Golf Club.